CABLE HIGHLIGHTS: ESPN’s NBA doubleheader was at 0.83 (Golden State vs. Clippers)/0.51 (San Antonio vs. Minnesota). Discovery’s GOLD RUSH dropped 0.04 to 0.62, with the lead-out hour down 0.09 to 0.42, and the lead-in hour at 0.24. A&E’s LIVE PD fell 0.07 to 0.57. HBO’s REAL TIME WITH BILL MAHER returned at 0.34. On We, LOVE AFTER LOCKUP rose 0.05 to 0.30, and EXTREME LOVE was steady at 0.11. HGTV’s MY LOTTERY DREAM HOUSE shrank by 0.07 to 0.30. MSNBC’s RACHEL MADDOW SHOW led cable news at 0.29/0.46/3.1M, with Fox News’s TUCKER CARLSON TONIGHT at 0.28/0.49/2.9M, and CNN’s CUOMO PRIME TIME at 0.25/0.33/1.4M. 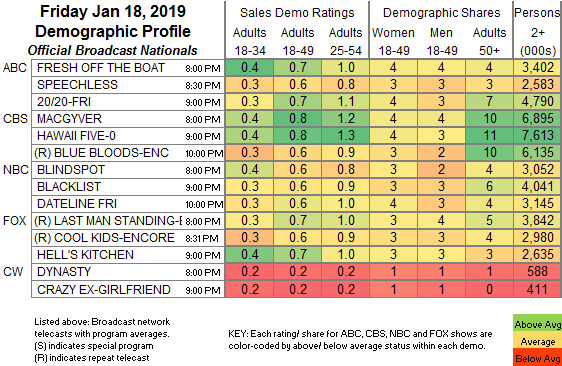 Food Network’s DINERS, DRIVE-INS & DIVES was steady at 0.29. On ID, SECRETS OF THE MORGUE gained 0.03 to 0.26, and YOUR WORST NIGHTMARE was up 0.04 to 0.25. 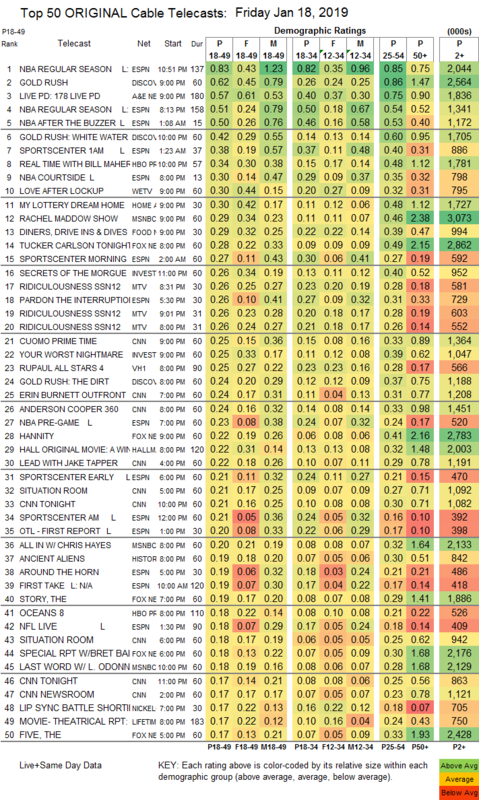 MTV’s RIDICULOUSNESS was at 0.26/0.26/0.26, compared to last week’s 0.23/0.22/0.21. VH1’s RUPAUL’S DRAG RACE edged up 0.02 to 0.25.